Squadron Leader Peter Carter is moments away from death. He is aboard a stricken WW2 Lancaster bomber on fire, plunging towards the English coastline. All his crew are dead. He has torn ribbons for a parachute. All he can do is jump (rather that "…than fry,"). Before he abandons ship, an American service girl, June, talks with him via radio. In the briefest of movie moments, I fell in love with this couple and had a tear in my eye as June desperately tries to find another way for Peter to escape death. The exchange that always floors me (as it did just now) finishes with June's words "I could love a man like you." Wow. What power the simple close up, actors who convince and writing that is heaven sent. There is no greater honesty than the kind delivered by those who know they're on their way out and in this instance, that honesty turned into an aching, emerging love despite the facts that (a) the couple had never met, (b) to the fated couple there were to be no happy endings and (c) it seems that the powers that be are sticklers for the rule of law. Heaven (referred to only once by name by Richard Attenborough as a young dead airman surveying an infinite celestial civil service) is a sumptuous black and white bureaucracy managed exclusively by women (angels?) who seem to busy themselves measuring backs for the wings that seem to be the other world's standard issue. Could this be an early example of talented film-making men instinctively knowing that if the women were in charge, it's really our only hope, our only chance of heaven? But, what ho! Peter's not turned up. His conductor to the after life, an outrageously overblown French aristocrat who lost his head, (played by Marius Goring) missed him in the fog on the night in question. He must go back down to Earth and bring Peter back. Peter wakes up on a beach and bemused but thoroughly of the opinion that he is in the next world, he tries to report in. 'Keep Out' reads the first sign of sense and in a bold and original mise-en-scene, Powell has Peter's first human contact, a naked goat herder playing a whistle, an image that could be mistaken for Elysium purity and innocence. It says a lot about our society (none of it good) that no film-maker would be allowed to shoot this scene today. In an astonishingly timed shot (come on, this was 1947. Computers used punch cards and what we have on our desks today could only fit in warehouses), a bomber screams overhead as Peter realises he's alive and in love. Peter now has to take on the powers that be for the right to continue living and loving. The movie is crammed full of memorable characters, wry humour and three central performances that would have given wings to a concrete mixer. 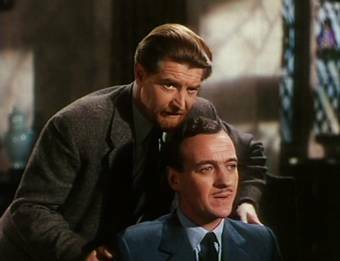 Niven is perfect as the handsome hero with a keen but disturbed mind. Probably better known as Zira in the Planet of the Apes series of the 60s and 70s, Kim Hunter plays June with lusty and affecting concern. Her friend Dr. Reeves (played by the P & P regular, he of the honey voice, the utterly marvellous Roger Livesey) fights for Peter's life in this world and the next. The movie also asks the big 'what if' question. It busies itself with spiritual matters, with Peter (a published poet) fully supportive of the idea of surviving human consciousness after death. The fantasy aspects of AMOLAD (P & P's movies have some fun acronyms. Try I Know Where I'm Going or IKWIG) are consistent with the basic tenets of Christian belief and the film puts love above all earthly or heavenly concerns which is as good a message as any. Love frustrates the bureaucrats up there and down here – it's more a matter of love or death but petty human traits and national prejudices also surface, those determined to drag Peter up the Stairway To Heaven (the US title) by hook or literal crook. The staging of Peter's hallucinations are notable by their simple but very effective special effects. As I said, this was almost 60 years ago but the movie starts with a pan of (ahem) the universe. Ambitious much? The freeze frame tableaux as Peter tries to warn his friends of his visit from the conductor are wonderfully playful despite the fact that an actor is incapable of standing completely still unless made so by an optical printer. A mention too for Alfred Junge whose astonishing designs don't manage to date the production at all. The special effects are notable for their sheer cheek. At one point the big heavenly court scene pulls back to reveal itself as a galaxy of stars (is that really where we go?). As an effect it is very convincing despite the obvious mix halfway through but it is the idea we applaud. CG could have made it perfect but perfect is rarely great, merely perfect. As an idea, the universal courtroom in Heaven is as bold as a puffed up bullfrog on a motorway. Apart from one rather too tidy 'Deus Ex Machina' (let's just say that a man needed another man's help but could only get it if the other man died that night… you see where I'm going with this?). But it's a small gripe (and my relationship with this movie is such that it hurt me to point it out) because the entire film is such a joy and an intelligent joy at that. Along the way (in the trial that will decide Peter's fate) the film changes tack and starts to be a revelatory treatise on prejudice and nationality. Let's be sure that love and Peter and June's fate is never abandoned but the wit and intelligence in these scenes (seemingly to affirm that we are all human beings regardless of the props and national quirks) quite takes one's breath away. Raymond Massey is the principal American actor playing the prosecutor in the afterlife and he is credible and eminently hissable. Guess what? Amor Vincit Omnia – love conquers all, even lawyers from on high. A happy ending but then was that in any doubt? A treasure of a movie made in the British milieu of kitchen sink 'reality', a fantastic fantasy with intelligence and wit. Presented in 4:3, the print is fair in quality with some slight strobing in both the colour and black and white scenes as well as exhibiting quite a few bits of dust and sparkle but never to narrative detriment. It's a shame someone hasn't cleaned up the best print available because the DVD version is only a promise of things to digitally come. The Technicolor process, so beloved by Powell (after all, the line "One is so starved of colour up there" was altered to "Technicolor" rather noticeably) can only be appreciated by seeing a sparkling print projected in a cinema. There is a reason Jack Cardiff is hailed for the superb craftsman he is and still to understand this, you have to see these films projected. A basic but clear mono soundtrack has been faithfully encoded to Dolby Digital with no noticeable special effects. The Colour Merchant (1998, documentary on cinematographer Jack Cardiff – 9'54"). Cardiff's work with Powell and Pressburger is world class but the most extraordinary and stunning revelation contained in this enthusiastic memoir is to see the actual size of the Technicolor camera in production stills (with sound proofing blimp attached it was enormous, like a prototype Mini). I mean to move the bloody thing, you'd have needed a forklift truck. The other stunning aspect of the life of Jack Cardiff (sadly not mentioned in the memoir) is the diversity of his work in film over (get this) over nine decades! And he's still working! Bravo. Got to get me some of that DNA. Just to open those eyes a little wider, here are a few of Cardiff's credits. It fair boggles the mind. But then, the man shot for John Huston, Alfred Hitchcock (is there another Hitchcock?) and Michael Powell…Check out the first three, one classic after another. 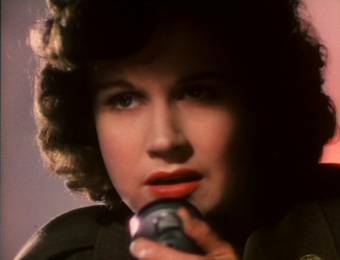 Repeated information about the three principals and Powell and Pressburger, nothing you couldn't find in ten minutes on the internet but a nice inclusion nonetheless.